Data from four ice-tethered buoys deployed in 2010 were used to investigate sea-ice motion and deformation from the Central Arctic to Fram Strait. 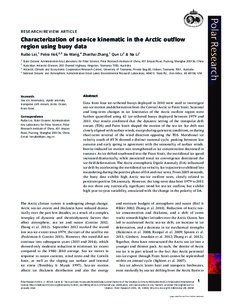 Seasonal and long-term changes in ice kinematics of the Arctic outflow region were further quantified using 42 ice-tethered buoys deployed between 1979 and 2011. Our results confirmed that the dynamic setting of the transpolar drift stream (TDS) and Fram Strait shaped the motion of the sea ice. Ice drift was closely aligned with surface winds, except during quiescent conditions, or during short-term reversal of the wind direction opposing the TDS. Meridional ice velocity south of 858N showed a distinct seasonal cycle, peaking between late autumn and early spring in agreement with the seasonality of surface winds. Inertia-induced ice motion was strengthened as ice concentration decreased in summer. As ice drifted southward into the Fram Strait, the meridional ice speed increased dramatically, while associated zonal ice convergence dominated the ice-field deformation. The Arctic atmospheric Dipole Anomaly (DA) influenced ice drift by accelerating the meridional ice velocity. Ice trajectories exhibited less meandering during the positive phase of DA and vice versa. From 2005 onwards, the buoy data exhibit high Arctic sea-ice outflow rates, closely related to persistent positive DA anomaly. However, the long-term data from 1979 to 2011 do not show any statistically significant trend for sea-ice outflow, but exhibit high year-to-year variability, associated with the change in the polarity of DA.